It's about to rain and the sky is all grey and gloomy here...so instead of following my original plan of posting another homemade ice cream recipe today, I thought of sharing with you a comforting fish and vegetable soup. It's called Sinabawang Isda. Sinabawan came from the root word "sabaw" which means soup. It's a dish I've first tried when I was in Davao, and is very similar to a dish I've featured before called Pesa. 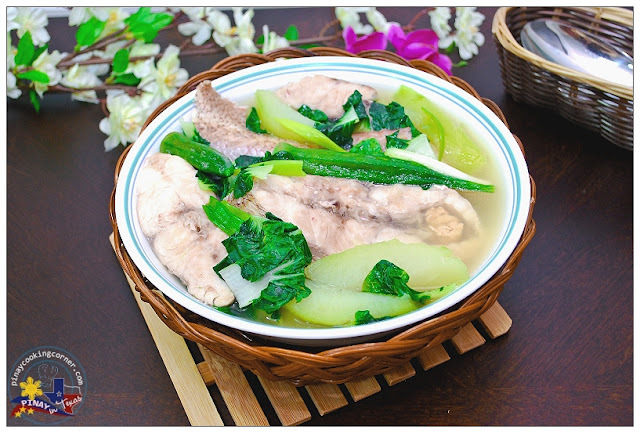 In both dishes, fish is cooked in boiling rice water with ginger and an assortment of vegetables. The only difference I know is that Sinabawang Isda has no onions and has less ginger compared to pesa and there's no sautéing involved. Sinabawang Isda is a dish that's very easy to prepare. Just put everything in a pot of boiling rice water (or plain water)...add some seasoning...wait for a few minutes and voila! You have a delicious, healthy and very comforting meal in no time! 1. Sprinkle fish with salt. Let sit for at least 15 minutes. In a large saucepan, combine rice water, fish sauce, garlic and ginger. Bring to a boil over medium heat. Add papaya. Cover and simmer for 5 minutes. 2. Add fish and okra. Cover and simmer for 10 minutes or until fish is cooked. Season with salt and pepper to suit your taste. 3. 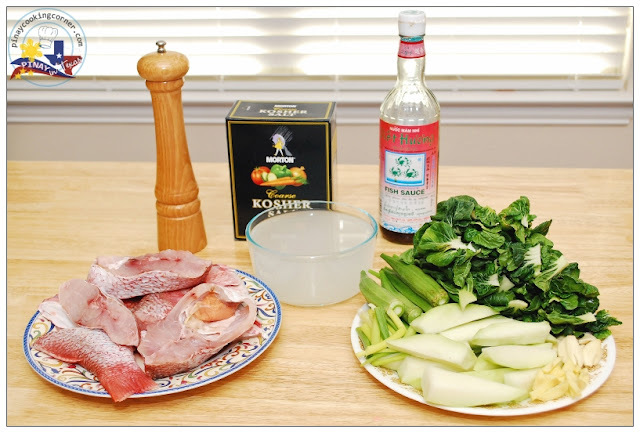 Add pechay and green onions. Simmer for 3 more minutes. Remove from heat. Serve with hot rice. 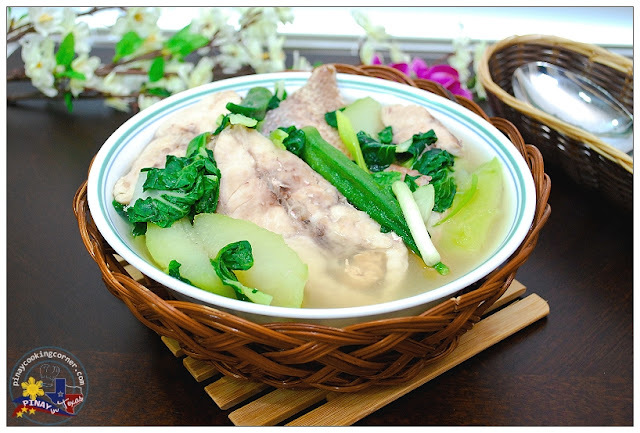 Note: Other fish that can be used are tilapya, pompano and lapu-lapu(grouper) Other vegetables that can be used are sayote (pear squash), upo (bottled gourd), sigarilyas (winged beans), Napa cabbage, dahon ng sili (chili leaves), spinach and saluyot (jute leaves). Delicious and healthy simple recipe Tina. We use rice water to make some curry. very interesting Tina! I am liking the ease of it. Could I use salmon? Yes Jessica, salmon will definitely work for this kind of dish! Tina this soup looks amazing! I love soups like this and will have to pin it for the fall! Have a great week sweetie! I usually post what ever I cook, I never planned anything. 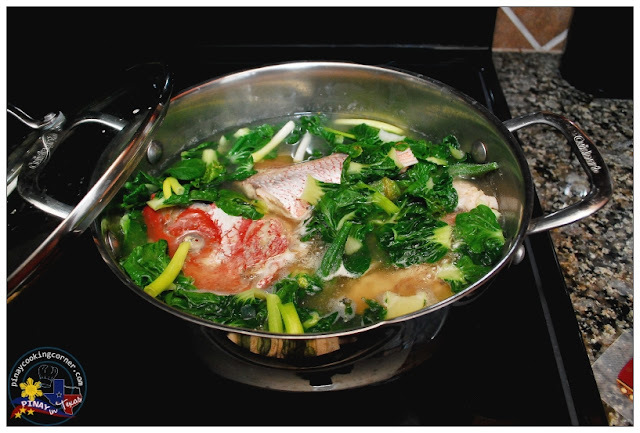 This fish soup dish looks hearty with greens. We normally rinse rice twice, the first rinse is to remove any dust, dirt or bugs in the rice grains. The water from the 2nd rinse is usually use for making soup, and yes, it does add a little thickness and it also makes the soup more flavorful. This looks like a great comfort food, Tina! And I crave comfort food not with the flu.. Thank you for sharing! I love these kinds of simple but oh so delicious meals. This looks fantastic, especially with all those greens and vegetables. This soup is so bright! :D What could we use if we do not have access to green papaya??? HUGS! Chayote (pear squash) would be a good substitute, Tiff! Firstly thanks for share.Your blog is really nice and unique also.I like it so much.